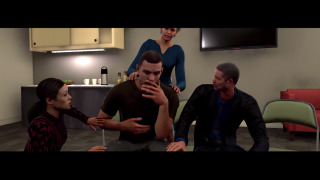 "Livin' Da Dream, A Spike Lee Joint" is not a movie or a TV drama, but a trailer for the story mode for the upcoming NBA 2K16. According to the Associated Press, Lee is a huge Knicks fan who when asked if he'd direct the single-player campaign said "It's about time I worked with 2K". From the look of the trailer, the story of player "Frequency Vibrations" will involve lots of drama and interpersonal conflict. It's unclear whether the story will change as a result of player performance, however, or if it'll just play out the same way regardless. We gave NBA 2K15 an 88 in our review, so expectations are high for the sequel when it becomes available on September 29. The real question is: can NBA 2K16's campaign match the extraordinary pathos of Barklay, Shut Up and Jam: Gaiden?